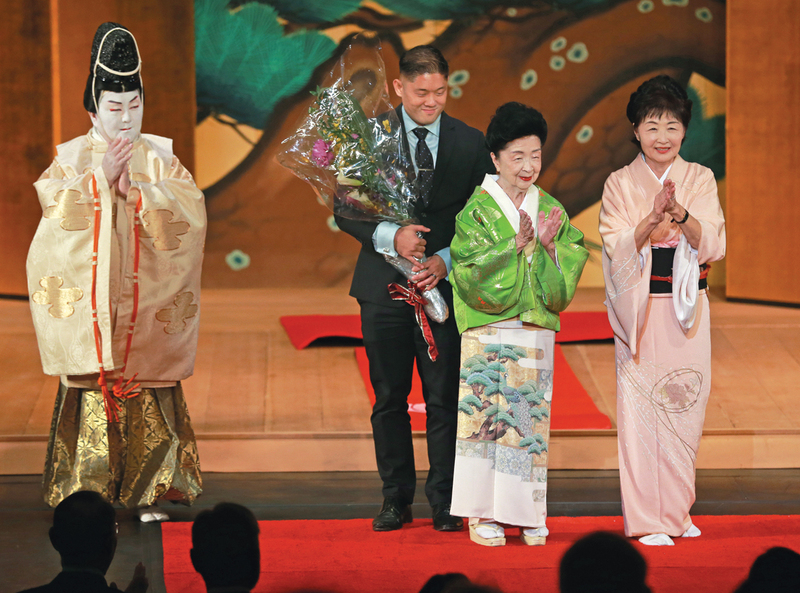 Madame Fujima Kansuma celebrated her 100th birthday in grand style on Nov. 18 with a performance of Japanese classical dance reminiscent of the famed Kabukiza Theater in Tokyo. 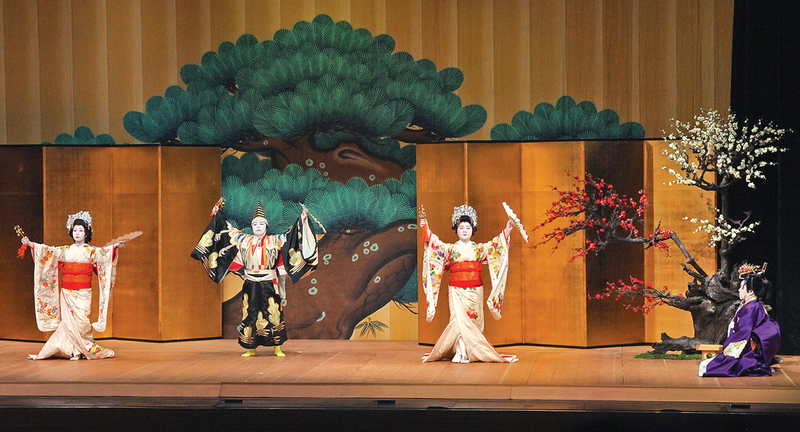 The dancers are all natoris who have been studying with Madame Kansuma for more than 40 years. 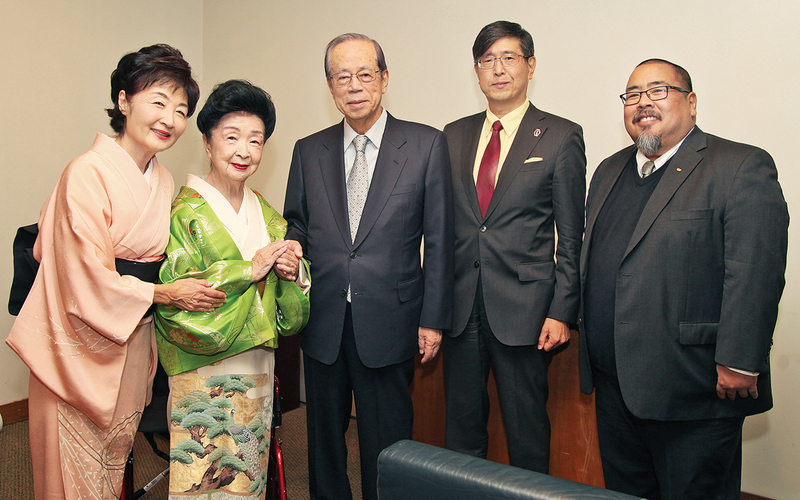 “We are both so grateful and humbled to have so many come out to wish her well,” said Miyako Tachibana, daughter of Madame Kansuma. Dr. Leonard Pronko, professor emeritus of Pomona College, explained that “Ninin Sanbaso” is an exuberant dance celebrating life, health and longevity. Sojin Kim, curator of the Smithsonian’s Center for Folklife and Cultural Heritage, traveled from Washington for the event. “I’m happy to be here in person to congratulate Madame Fujima Kansuma on behalf of the Smithsonian,” Kim said. Emcee for the program was retired Court of Appeal Justice Kathryn Doi Todd. Special greetings were offered by former Prime Minister Yasuo Fukuda, who praised Madame Kansuma for her cultural contributions and also her strong, youthful spirit. Kansuma, who turned 100 in May, has taught more than 2,000 dancers, 48 of whom have been granted professional standing by kabuki grandmasters. 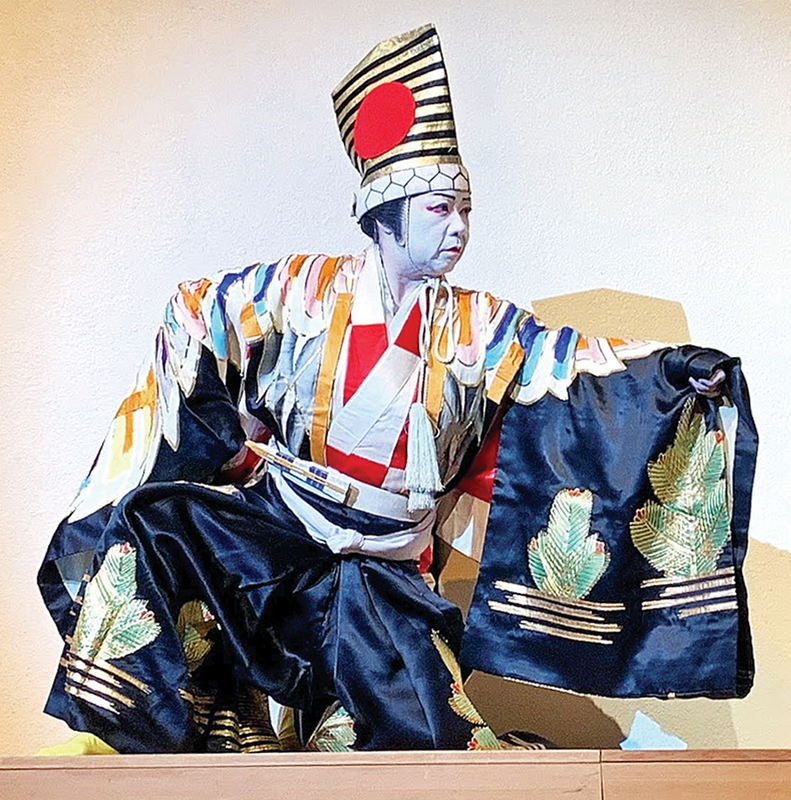 Her troupe, Fujima Kansuma Kai, has performed extensively at such venues as the opening of the 1984 Los Angeles Olympics, the 1980 Tournament of Roses Parade, Japanese festivals at Disneyland, and the Dorothy Chandler Pavilion. Most recently, she served as the official Nisei Week choreographer in August. This event was a co-production of the JACCC, Smithsonian Center for Folklife and Cultural Heritage, Japanese American National Museum, and Alliance for California Traditional Arts, and received federal support from the Asian Pacific American Initiatives Pool, administered by the Smithsonian Asian Pacific American Center. 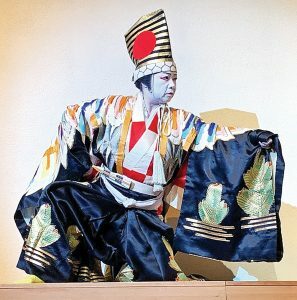 At the conclusion of the performance, the audience gave Madame Kansuma a standing ovation and she expressed her appreciation, leading the group in a rousing sanbon jime cheer.